The Windows 7 Disk Management tool provides a simple interface for managing partitions and volumes. Here’s an easy way to shrink a volume to free up space so you can create a new partition on your disk. Open the Disk Management console by typing diskmgmt.msc at an elevated command prompt. In Disk Management, right-click the volume that you want to shrink, and then click Shrink Volume. 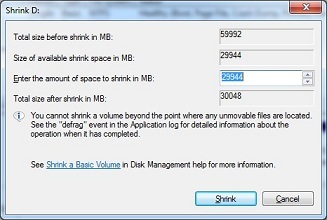 In the field provided in the Shrink dialog box, enter the amount of space by which to shrink the disk. Total Size Before Shrink In MB Lists the total capacity of the volume in MB. This is the formatted size of the volume. Size Of Available Shrink Space In MB Lists the maximum amount by which you can shrink the volume. This doesn’t represent the total amount of free space on the volume; rather, it represents the amount of space that can be removed, not including any data reserved for the master file table, volume snapshots, page files, and temporary files. Enter The Amount of Space To Shrink In MB Lists the total amount of space that will be removed from the volume. The initial value defaults to the maximum amount of space that can be removed from the volume. For optimal drive performance, you should ensure that the volume has at least 10 percent of free space after the shrink operation. Total Size After Shrink In MB Lists what the total capacity of the volume in MB will be after you shrink the volume. This is the new formatted size of the volume. Once you have unallocated space, you can use that space to create a new partition. For a tip on creating a new partition, see Creating Partitions, Logical Drives, and Simple Volumes.